Study of the flow of materials that behave that behave in an interesting or unusual manner is known as Rheology. 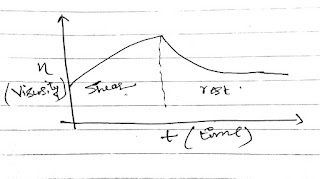 Newton's law of flow: According to Newton's law of fluid, Shear stress is directly proportional to the shear rate. Here, proportionality sign η represents the dynamic velocity having unit Pascal. SI unit is Poise. Kinematic Viscosity is given as, Dynamic Viscosity(η)/ Density of the fluid (ρ). Units are meter square per second or stokes. Fluids obeying Newton's law of fluid are known as Newtonian fluids. e.g. water, Benzene, Mineral oil, sugar solution etc. Non-Newtonian systems: Fluids which do not obey Newton's law of flow. a) Pseudoplastic behaviour: In this fluid, viscosity is inversely proportional to the shear rate. In other words, as the rate of shear is increased viscosity of these fluid decreases. Expressions for these fluid is; τ = Kγn, where n is less than 1.
e.g. Suspensions, Dispersion, Creams, Lotions, Gels etc. b) Dilatant: In this fluid, viscosity is directly proportional to the shear rate. In other words, as the rate of shear is increased viscosity of these fluid decreases. Expressions for these fluid is; τ = Kγn, where n is greater than 1.
e.g. Surfactant solution, Corn starch dispersion, Wet sand etc. 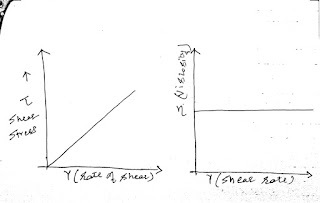 c) Plastic fluid (Bingham bodies): These types of fluid do not show any shear rate initially after applying shear stress. After a certain value of shear stress they start behaving like Newtonian fluid. Toothpaste is the classic example of plastic fluid. 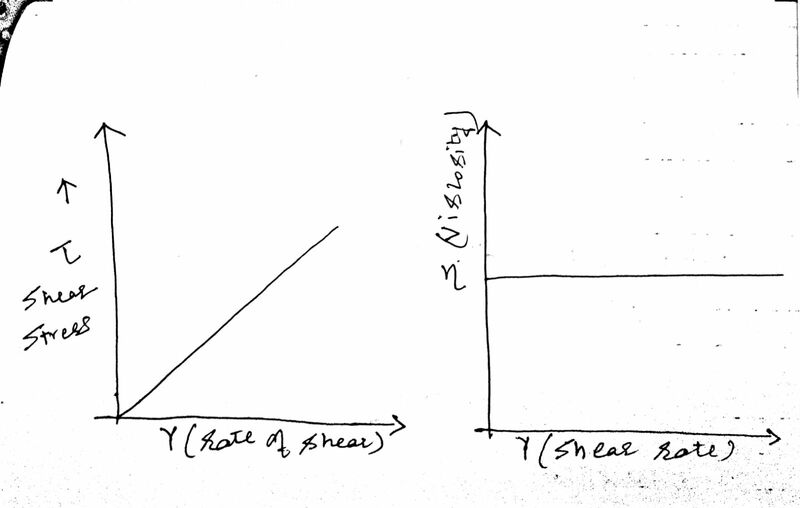 Yield point(τ0): It is the max value of shear stress (τ) at which shear stress remains 0 in plastic bodies. 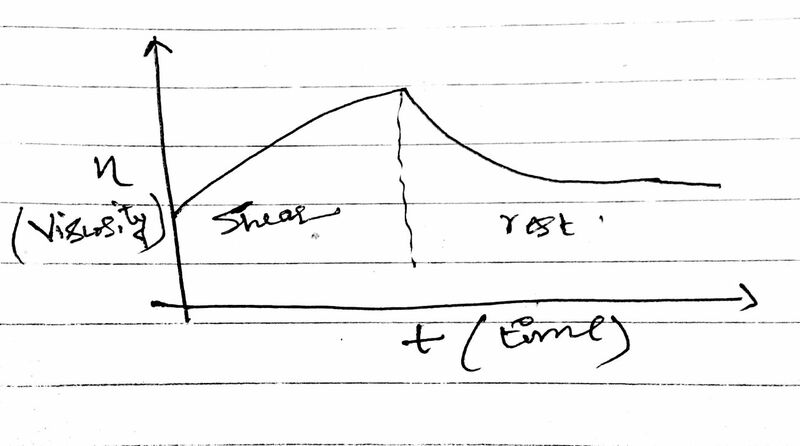 d) Thixotropy: In this type of behavior, viscosity of the fluid is decreased with shear stress, after removal of the stress fluid returns to the normal. Such systems are also known as Gel-Sol-Gel transformation. e.g. Paints, Ketchup, Pastes etc. e) Rheopexy: This is totally opposite to the thixotropy and therefore also known as negative thixotropy. In this type of behavior, viscosity of the fluid is increased with shear stress, after removal of the stress fluid returns to the normal. Such systems are also known as Sol-Gel-Sol transformation.